Today marks the commemoration of the 70th anniversary of the Liberation of Bergen-Belsen Concentration Camp by British armed forces. My grandfather, Nathaniel Miller FRCS (Fellow of the Royal College of Surgeons) was a doctor in peacetime, and during WWII became a Major in the Royal Army Medical Corps (a British Army specialist corps providing medical services to all British Army personnel and their families in time of war and peace). This photo (below) hangs on my wall at home, taken in December 1944, several months after their unit’s involvement in the D-Day landings and Pegasus Bridge (a story for another day) and taken 5 months before the liberation of Bergen-Belsen. My grandfather is third from the right, front row, Major N.A. Miller. Camp ONE at 477658 is enclosed with barbed wire. Camp TWO at 483675 is an ordinary unfenced hutted camp. There is a supply depot for these at 482691 and hospitals (one of which is, however, at present a normal military hospital) at 459676, 473678 and 484682. 2. The guard at the camp consists of a unit of approx 700 Hungarians (complete with families), a proportion of Wehrmacht tps and certain SS Guards. There are also a Wehrmacht Adm HQ at the Commandantur and SS Adm Tps (cooks, storekeepers and book-keepers). Gastric Enteritis ….. a very large number. 4. Is it essential that this area should be kept as free of our tps as possible and that the persons at present in the concentration camp should be kept there till adequate arrangements can be made to sort them out – both from the point of view of preventing the spread of disease and preventing criminals breaking out. 5. Accordingly, in the interests of our own tps, the civil population and the Wehrmacht, certain negotiations were made with 1 Para Army. Details of the arrangement reached are at Appx ‘A’ and every effort will be made on the British side to carry these out. It is considered that from their own point of view the Germans have every intention of fulfilling their obligations to the best of their ability. 6. Units will ensure that all tps likely to go into the area are aware of the position and of the agreement reached. Tps will be instructed to uphold the authority of German and Hungarian guards and, if necessary, to render assistance. These guards will retain their arms and MT (incl 4 ancient and immobile DF tasks) and their orders and duties will be respected. It is thought that a serious risk of disturbance and attempts to break out will arise with the approach of the British tps. 7. As soon as operations permit the whole of the area concerned will be placed OUT OF BOUNDS to all British tps except on essential duty. 8. The necessary plans for taking over the administration and care of this camp and for the sorting of the prisoners are being made by 8 Corps and the sole responsibility of fmns is, so far as is humanly possibly, to respect the agreement given at Appx ‘A’ and to see that prisoners do NOT escape. 9. The name of the Military Commandant of BERGEN is Oberst [HAHRIES?] and of his Assistant Oberst SCHMIDT. On arrival of our tps they will be at the Commandantur ready to hand over their authority but to continue to carry out their task. (a) The Hungarian Tps (and families) have 4 weeks food. (b) The German guard will be able to feed themselves. (c) The prisoners have food for about 4 days but there is NO bread. (c) Washing and Laundry arrangements (incl soap). (d) Digitalis, Tanalsin, heart stimulants. 1. Major NA MILLER RAMC with Section Officer and complete Section from 224 Para Fd Amb (Section Offr preferably one who speaks German) will enter the camp at the earliest possible moment to assess the Medical position and organise the Medical services. 76 Fd Hygiene Section will accompany (instrs DDMS 8 Corps letter 8C/6632/M dated 13 Apr) and will be responsible for general hygiene and dusting of all personnel. If further medical assistance is required, Major NA MILLER will contact this Office immediately. 2. Electrical power will be required at the earliest possible moment. It is understood that the internal water supply is dependent on this and presumably water borne drainage. 3. Water – Pending restoration of normal services a RE Water Point producing 40,000 gallons per day may be required. 4. Laundry – A complete mobile bath and laundry unit will be necessary in the early stages pending restoration of water supply. 5. Food Supplies – It may be necessary to limit and modify in the early stages the food intake of personnel in a seriously starved condition or following disease. It is recommended that provision be made to have adequate quantities of available milk products brought to the area. Full PW scale of diet will almost certainly NOT be required until the end of a fortnight. 6. Clothing – No information but likely to be inadequate in scale, both personal and bedding. 7. AL 63 Mark III – large quantities will be required (6 tons). 8. Additional British Medical Staff may be required to assist in admin and reorganisation at a later date. 9. The amount of British Military Traffic throughout the area should be strictly limited to essentials. All personnel must be dusted with AL 63 Powder before entering the area. 10. Medical supplies – Local resources are being assessed now and should cover immediate requirements. If ever there was a journey I would like to have taken with my grandfather, now deceased, it is that journey on 15 April 1945, into Bergen Belsen; to witness the end of one time of evil, and the beginning of a new journey for the survivors of that camp. This post is simply my own way of helping me never forget, that even though I never saw and never smelled and never witnessed the barbarity of Bergen-Belsen, I believe and stand on the testimony of those who did, not least my own grandfather. I have just returned from the Belsen concentration camp where for two hours I drove slowly about the place in a jeep with the chief doctor of Second Army. I had waited a day before going to the camp so that I could be absolutely sure of the facts now available. I find it hard to describe adequately the horrible things that I’ve seen and heard, but here, unadorned, are the facts. There are 40,000 men, women and children in the camp. German and half a dozen other nationalities, thousands of them Jews. Of this total of 40,000, 4,250 are acutely ill or are dying of virulent disease. Typhus, typhoid, diphtheria, dysentery, pneumonia and childbirth fever are rife. 25,600, three quarters of them women, are either ill through lack of food or are actually dying of starvation. In the last few months alone, 30,000 prisoners have been killed off or allowed to die. As we went deeper into the camp and further from the main gate, we saw more and more of the horrors of the place and I realised that what is so ghastly is not so much the individual acts of barbarism that take place in SS camps, but the gradual breakdown of civilisation that happens when human beings are herded like animals behind barbed wire. Richard Dimbleby was the best known British broadcaster of his generation. His superiors in London initially refused to believe this report. It was only when Dimbleby threatened to resign that the report was broadcast. It brought home to a British audience the horror of what had occurred at Belsen, although the broadcast version was heavily edited. Bergen-Belsen differed from other concentration camps such as Auschwitz-Birkenau or Treblinka – there were no gas chambers in Bergen-Belsen; no systematic policy of murder in place. Bergen-Belsen’s victims died to the sheer brutality and neglect of the SS, a reflection of the camp’s staff’s deep antisemitism and total disregard for human life. In the final months of the WWII, thousands of mainly Jewish prisoners were evacuated to Bergen-Belsen from camps in the east such as Auschwitz-Birkenau. The conditions were beyond inhumane, and directly caused the death of tens of thousands of the camps prisoners in 1945. 15 April 2015, today’s date, marks the beginning of Yom HaShoah, the date in the Hebrew calendar on which Jewish communities annually commemorate the Holocaust. The good people of the Holocaust Educational Trust give some excellent ideas about ways to commemorate today in communities across the world (e.g. readings from Holocaust survivors and British liberators; tree-planting as a memorial; lighting a candle and having a minute’s silence). For me this post is my commemoration, and it draws heavily on the factual material that has been circulated by the Trust here. And we knew we were liberated. Needless to say, our feelings were very mixed. So we were liberated. So thank God we are alive. But are we really thankful? Who are we? Where are we going to go? What are we? Judy Rosenzweig was born in Petrosani in Romania in 1924, one of eight children. She lost her parents and three of her siblings during the Holocaust, when Petrosani was part of Hungary. Judy was deported to the Nazi concentration and death camp Auschwitz-Birkenau in the spring of 1944. She was later sent to a forced labour camp in Hamburg from where she was eventually sent to Bergen-Belsen concentration camp in the spring of 1944. Her testimony typifies the ambiguous reactions that many survivors felt on liberation. April 15, 1945, was like any other day – but not for us. We were reborn on that day. Few of us believed that we should ever survive and see freedom again. As to the outside world, it counted us among the dead martyrs, and put a tombstone over our graves, as it were. It is a strange feeling being reborn at a mature age. Normally, people do not remember the details of the day of their birth, of course. But we do – all the details of that April 15. As the wearisome days of our captivity dragged on endlessly, we had lost sense of time and of continuity. Very often, we envied those who died in their own homes, on their own beds, before we were sucked into the bloody cauldron. We were neither alive nor dead in captivity. Our legs moved heavily and our hands performed mechanical function, but there was no spirit in us – spiritually, we were dead. Looking back, I don’t know myself how we survived and where we took our strength from. The fact is that a new people had arisen on the graves of the martyrs… We survivors will always remember April 15 as a second birthday –perhaps in a sense a more important one than the first. Paul Trepman survived the Warsaw Ghetto, Majdanek and Gross-Rosen concentration camps, and a number of forced labour camps before being sent to Bergen-Belsen. After the liberation, he played an activerole in the political and cultural life of the Displaced Persons camp established at Bergen-Belsen, editing Yiddish newspapers and poetry anthologies. He emigrated to Canada in 1948. It was shortly after the BRCS [British Red Cross Section] teams arrived, though it may have no connection, that a very large quantity of lipstick… arrived. This was not at all what we men wanted. We were screaming for hundreds and thousands of other things and I don’t know who asked for lipstick. I wish so much that I could discover who did it, it was the action of genius, sheer unadulterated brilliance. I believe nothing did more for those internees than the lipstick. Lieutenant-Colonel Gonin oversaw the relief efforts of British Army personnel at Bergen-Belsen. This remarkable story demonstrates that the rebuilding of survivors’ lives after the Holocaust required more than the restoration of physical health. A camp was first established at Bergen-Belsen in north-western Germany in 1940 for French and Belgian prisoners of war. It was extended in 1941 to hold Soviet POWs. In the spring of 1943 most POWs were sent elsewhere and the first Jewish prisoners arrived. Belsen became part of the concentration camp system, although it was unlike other camps for Jews at this stage: the majority of the early Jewish prisoners belonged to special ‘privileged’ categories, including citizens of neutral countries and ‘exchange Jews’, who were held for potential trade for German prisoners in Allied countries or cash payments (few of these deals ever occurred). The camp was transformed by two developments in 1944. The first was its designation in the spring as a ‘rest camp’ for sick prisoners from other camps, who were brought to Belsen to die. The second development came in the autumn with the beginning of transports from camps in the East, especially Auschwitz-Birkenau, as the SS responded to the advance of the Red Army by evacuating prisoners. The first major arrival was a transport of 8,000 women, including Anne Frank and her sister Margot, from Auschwitz. There were insufficient barracks so the women were accommodated in specially erected tents which then blew down in heavy storms. From January 1945 onwards, tens of thousands of mostly Jewish prisoners were brought to Belsenin the so-called ‘death marches’. Overcrowding, lack of food and a typhus epidemic caused the deaths of 18,000 people in March alone. By the time of liberation in April 1945, there were an estimated 53,000 people held in the camp. 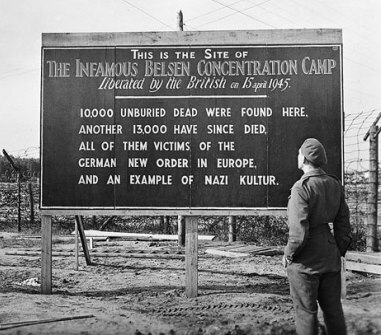 Approximately 120,000 people were held in Bergen-Belsen at some point during the war. At least 52,000 died, most in 1945 as a result of starvation and epidemics. Most of these victims were Jews who had already endured months or years of captivity in camps such as Auschwitz-Birkenau. The victims also included several thousand Poles who had either been evacuated from Auschwitz or been sent directly to Belsen after the Warsaw Uprising of 1944. The other major victim group consisted of approximately 14,000 Soviet prisoners of war who had died through deliberate policy of starvation in late1941 and early 1942. The camp was liberated by British troops on 15 April 1945. By this time, most prisoners were seriously ill. Despite the efforts of medicsand relief agencies, more than 10,000 people died in the weeks after liberation. The camp was burned down in May1945 to prevent further spread of epidemics and the survivors were relocated to hospitals or nearby German army barracks. Most survivors returned to their country of origin but more than 20,000 Jewish and Polish survivors did not wish to. They were housed in a Displaced Persons (DP) camp in the former army barracks; the last survivors only left in September 1950.